Because of these vulnerabilities, the routers could allow an attacker to carry out Domain Name System (DNS) spoofing or DNS cache poisoning. This is a computer hack where data is introduced into a DNS resolver's cache, causing the name server to return an incorrect IP address and diverting traffic to another computer or to the attacker's computer. To perform this type of cache poisoning attack, the attacker takes advantage of the flaws in the DNS software. The server could end up caching the incorrect entries locally and relaying them to the attacker making the same request. This spoofing also allows the attacker to direct users away from a website to another site they select. A user whose computer has referenced the poisoned DNS server is thus tricked into accepting content coming from a bogus server, potentially downloading malicious content such as worms or computer viruses. Through these vulnerabilities, an attacker can also intercept credentials sent as cleartext. The company, which uses plaintext HTTP to send information to the N600 routers, could enable an attacker in a man-in-the-middle position to block firmware updates or send arbitrary files to the routers. Moreover, Belkin N600 routers by default don’t have a password set for the web management interface. Therefore, a local area network (LAN) attacker could get privileged access to the router’s interface and use the weakness to do cross-site request forgery (CSRF). 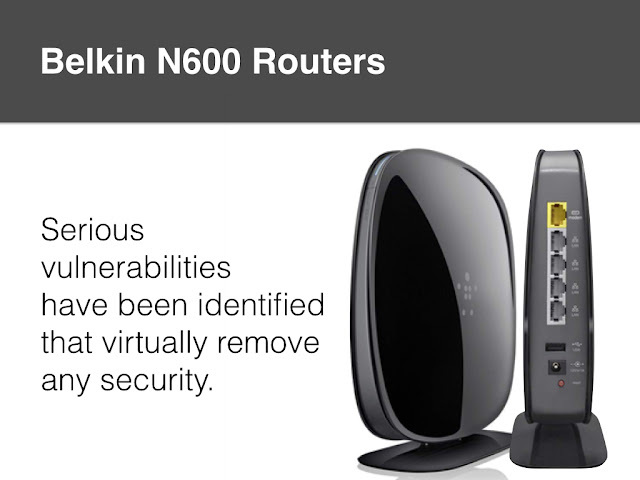 Belkin routers contain a global cross-site request forgery bug. With the default configurations set to no password protection, an attacker can perform actions as part of an attack that does not require the victim to have an active session.